Here in Massachusetts the day to day temperatures have been close to those in Pune, India, my recent home away from home. Humidity is much greater here … yesterday outside doing some errands the feeling was like being in Mumbai, 33 degrees C and 75% humidity. Hereabouts weather often resolves itself sharply. Around 6 pm the skies quickly darkened and as if a switch was flipped suddenly we had heavy rain and cannon-shot thunder, for about 30 mins. After all was cool, calm and lightly breezy, the cloying touch of high humidity gone from the air. 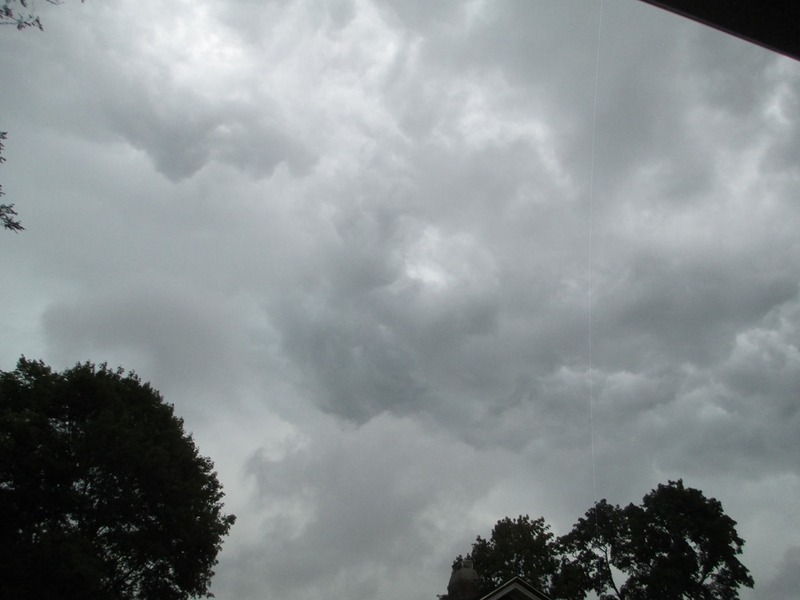 This harsh weather was a pleasant diversion for myself and Kim; we sat on our back porch relaxing, sipping wine while the downpour drenched a few backyard grillers in our immediate neighborhood, or set dogs to yowling whenever the thunder cracked. Weather on the other side of the world can do much worse than drench your cookout or scare the family pet. In India and Pakistan the monsoon is not yet done and this past week more than 200 people perished in floods from powerful rains. I still follow India and South Asia news and so I see these things as they happen, but I daresay most westerners know the danger the extremes of weather pose in that part of the world, perhaps remembering the Bangladesh floods of 1974 and 1984. 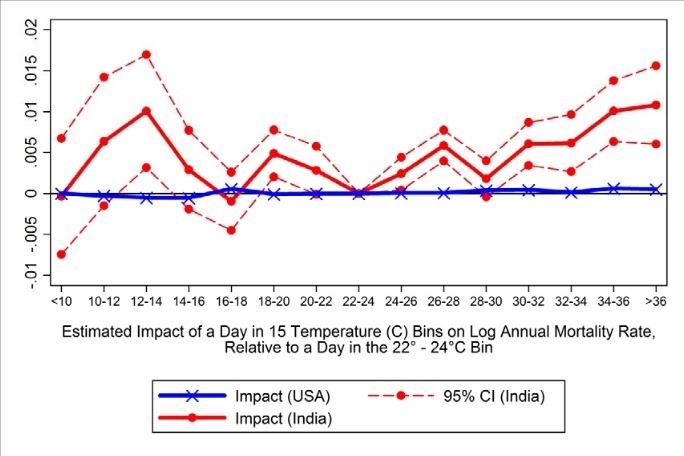 A baseline day has a temperature of 22 – 24 degrees C. The blue line shows how mortality in the USA goes up or down, on average, on days of higher of lower temperatures. This blue line is pretty flat; your chance of dying in the USA stays the same no matter the temperature. Well, everyone seems to complain about the weather but no one does anything about it. That’s not the Salazar way, though. We’ve already taken initial steps towards getting a photovoltaic solar system for our home; in fact this coming week we have scheduled site visits from two contractors we are evaluating. This expected PV system will certainly save us a lot of money and, I like to think at least, in a tiny way will lessen the risk of extreme weather for everyone. More news on this when we get the detailed proposals. The “thousand charms” are choice. For me I can be soaked by rain or not, depending on my mood. Everyone deserves the choice of watching the weather – or not – without fear. No, not pictures as in tourist snaps … pictures as in data visualizations. Wife Kim sent me a link to an interesting site, Data Stories (India). This is the blog of Avinash Celestine, a journalist with India’s The Economic Times. The idea of Data Stories is it shows interactive visualizations of different types of Indian economic and socio-metric data. Where I live in Pune about 18% of households have all these things. The message here is how wealth in India is concentrated in a small number of urban centers. India and China are represented by flat lines in their respective graphs. The other lines represent the relative proportion of that country or region’s per capita income to the base country at that point in time. In 1975 USA per-capita income was about 18 times that in India, and maybe 19 times that of China. But notice how in the China chart the USA line starts sloping down steeply starting in around 1977? By 2005 the USA:China ratio has dropped from 19:1 to 6:1, but in India with its more gently sloping line, the ratio has not dropped much, from 18:1 to 12:1. What to make of these visual presentations? I’ll leave the public policy aspects of these to the side and just say: We need more of this stuff. Thinking I might make my own geographic visualization I did some quick Googles on the topic. Conclusion: There’s not that much out there that can do this quickly. Microsoft sells an add-on for Excel called MapPoint that looks quite powerful, but at $300 list for the North America edition, it’s not going to get my vote. There’s some Flash- and/or web-based tools out there, like StatPlanet and BatchGeo, but tools like these definitely have a learning curve. Isn’t there something easier? Note to self: Government of India has many data-sets available online. Try to find a likely one and then make a ManyEyes visualization of it. At Brad DeLong’s blog I came across this book by Tom Slee, which is from 2006. The subject is how individual choice – the unquestioned mantra of libertarians and most conservatives – in the aggregate leads to outcomes that are collectively disadvantageous, like the demise of downtowns and their replacement by the Wal-Mart monoculture. What became known as the Chicago School had been busy attacking the then-dominant Keynesian ideas that government spending could be used to carry economies through recessions and even pull them out of depressions … One weapon that the school used was the idea of "rational choice." It took the idea of self-interested exchange–a theory introduced in the 18th century by Scots economist Adam Smith–to, and many would say beyond, its logical extreme. The members of the Chicago school insisted that all decisions, including even non-economic ones, could be understood as the product of self-interested rational individual choices, and they therefore announced that the market was the pathway to prosperity and growth. During the "Me Decade" of the 1980s these ideas found their way out of academic journals and into the public arena. The centrality of the individual and the rejection of community found its voice in Thatcher’s famous declaration, "There is no such thing as society. There are individual men and women, and there are families." Hmm. The Iron Lady is still with us, though it seems likely not for much longer; but one has to wonder, if there was no such thing as “society”, what was she Prime Minister of? Back to the book, I’d like to get the whole thing but it doesn’t seem to be available as an e-book; when next back in the US I’ll have to look for a used copy. Meanwhile Slee’s blog has some interesting stuff, like this post on Peer-to-Peer Hucksterism, where he takes to task services like Uber (the ride-sharing virtual taxi app) and AirBnB (the service that let’s people rent rooms out of their homes). Slee’s contention, which I agree with, is that far from liberating resources and choice for the benefit of consumers, these services extract large fees but take no responsibility for the services being negotiated. There are reasons we have regulations on taxis and hotels. They are mainly so I as a consumer can engage a car or a room with expectation of a certain quality of service – and, to give me a standard channel for recourse when I don’t receive that level of service. Anyway, individual choice vs. collective goods. Neat topic. Leaping from economics to literature, I wonder why there aren’t any/many anti-libertarian dystopian novels. there’s plenty of pro-libertarian novels, from 1984 to Atlas Shrugged and even The Hunger Games. Maybe I’ll save this thought for another post. Above you see Ishanya Mall from a few months back. Kim and I visited yesterday to make some purchases and then, as all the times I’ve been there before, the place was nearly empty, the goods in the stores scattered and poorly presented, and the buildings themselves half-finished and the finished parts already crumbling. Ishanya is supposed to be Pune’s prime destination for home furnishings. You definitely can get some things there, but as I think the picture shows the place is hardly “prime”. Ishanya does not even have its own website – if you go to ishanya.com you end up at a Facebook page for a fleamarket in the mall. Visits to crowded Indian urban centers unleash sensory assaults: colorful dress and lilting chatter provide a backdrop to every manner of commerce, from small shops to peddlers to beggars. That makes for engaging tourism, but not the fastest economic development. In contrast to China’s full-throated, monochromatic embrace of large-scale manufacturing, India more closely resembles a nation of shopkeepers. Nation of shopkeepers indeed. Everywhere you go you see these 2-3 person operations, from auto-maintenance, to plumbing, to “medicinals” (drugstores), to furniture, groceries and more. The predominant Indian business plan goes like this: Get some stuff to sell; Find an unoccupied stretch of sidewalk; Sit down there and sell your stuff. Meanwhile large scale efforts flounder. Another example is the mall near my flat, Koregaon Park Plaza (their website was offline when I wrote this). This mall boasts many western brands but like Ishanya never seems to have any customers – Hypermarket is the only store doing business. Now, there are successful malls here, like Amanora Park Town, but Amanora is really its own township where 1,000s of better-off Indians live. Amanora is also very close to Magarpatta City, another self-enclosed township. 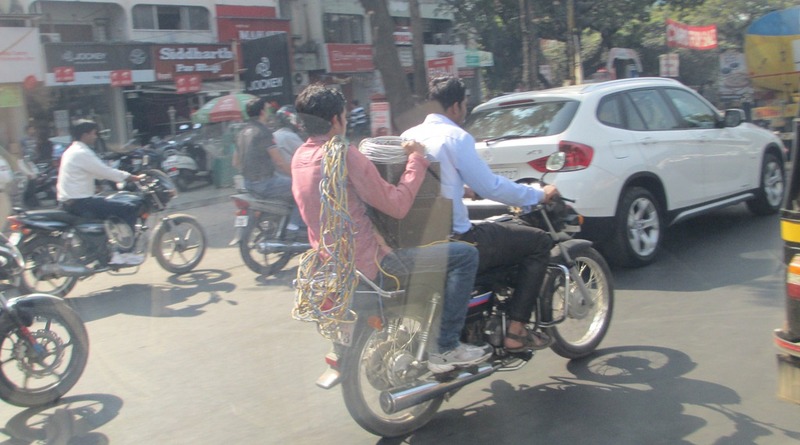 I’ve seen a great many ridiculous things being transported by two-wheeler, including ladders, pipes, stacked paint-buckets and more. The bottom-line is the majority of Indians can’t get to a centralized superstore of any kind, and even if they did they could not bring back much. Most people do some sort of shopping every day, getting just enough food, for example, for today and tomorrow. Wait, you say – doesn’t India boast a number of fast growing industrial conglomerates? What about Tata Group (revenue >$100b in 2011-2012), Reliance Group (revenue >$66b) or Bharti Enterprises (revenue >$10b)? Surely these examples prove that economies of scale are being used in India? Yes, these are large, successful companies, but it would be incredible in a country of 1 billion persons that there were not some such enterprises. A telling example for me is construction, obviously an important industrial category and one critical for growth. A recent report on top 200 construction firms worldwide includes only 1 Indian firm, Larsen & Toubro, at #43 worldwide, while China has 5 firms just in the top 10 and a great many firms throughout the top 200. India’s worldwide share of construction revenue is less even than Sweden’s, which takes 2.2% of the total. A particular embarrassment for India is that in the neighboring country of Bangladesh, Chinese construction firms are overwhelmingly favored over Indian. A factor here is that China has the cash to extend significant loans to Bangladesh. GDP growth is certainly respectable, but look at GDP per capita. An incredible disparity. 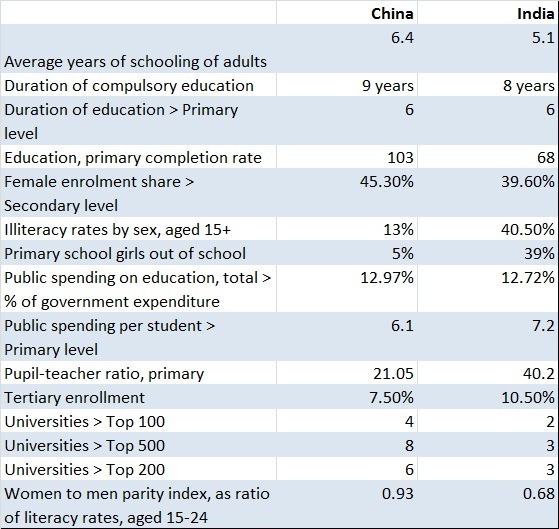 In some criteria India and China are comparable, or India even excels China. But look at the pupil-teacher ratio and primary completion rate; is it any wonder the total illiteracy rate is so high? It is no surprise that buildings and roads seem to fall apart so quickly here – imagine how many of the people building those things were illiterate. And the metrics on females – 39% of school-age girls out of school, and literacy of men nearly double that of women. India is purposefully not educating half of its people. While there is substantial public spending on education, Indians at all levels with any disposable income look to enroll their children in private schools. Recently on my way to work I saw a queue of 100s of people; I later found they were in line to file admission forms at a school close to my office. My driver, Rupesh – in many things my touchstone for the average guy over here – told me that to enroll his kids in the school he wanted he stood in a queue for 12 hours, beginning at midnight. Paying their fees, after rent and food, is his major expenditure. According an official from the school board, one reason for the seats remaining vacant was that the schools were not being approached by children from the economically and socially weaker sections. Only by being here can you know what this means. Many people here in low positions can barely look into the face of a rich person. It is an incredible act of courage for an Indian of lowly estate – a child, especially – to put themselves side-by-side with their social “betters”. What is shown here is a graph of per-capita GDP growth, starting in the year 1300 and projecting to 2100. Neat, huh? This is projecting the possibility that for my kids and their kids, they will be living in a static time where things pretty much stay the same generation to generation. No problem, if by then we finally all have flying cars and universal health care – not so great if we don’t. Paul Krugman has lately been writing about this, and another really interesting and related idea, the role of robots in future growth. At IBM where I work I’m a member of the IBM Academy of Technology, which does a yearly internal survey of members on business, technology and social trends for the coming year. In answering the survey Krugman’s recent observations were much on my mind – however the predictions play out I think these are critical challenges for the next 20 years. Here’s the substance of the two ideas. On growth, the seed is a paper by Robert J. Gordon, entitled Is US economic growth over? Faltering innovation confronts the six. Gordon observes that the Western world has had three periods of growth: The first started in the 18th century, lasted roughly 100 years and introduced steam power and railroads – this is what is typically termed the Industrial Revolution. The second was a technological revolution, running from around 1870 to the Great Depression; this phase brought electricity, internal combustion, chemicals, petroleum and control of infectious disease. The third phase, shortest and most recent, started in the 1960s and is all based on information technology and communications. This arc of technological progress is familiar to everyone in the developed world and it’s central to our implicit belief that things will always get better. The narrative goes like this: My grandparents as kids had neither electricity nor indoor plumbing; then my parents had both but no information technology; and now we have online banking, digital entertainment and hybrid automobiles. 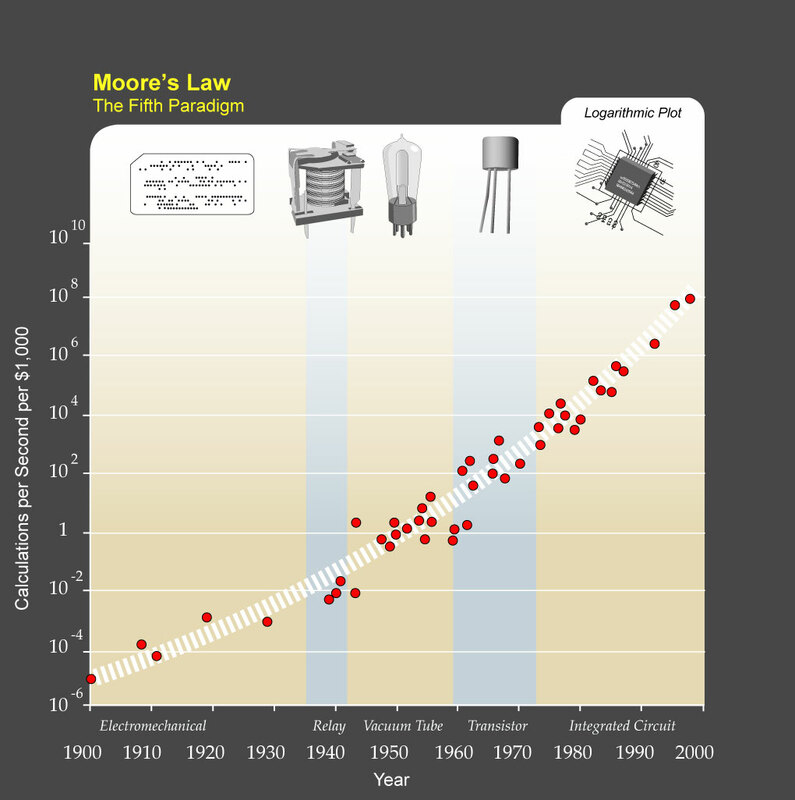 Can the technological singularity not be fast approaching? Gordon’s thesis however is that the growth brought by the IT revolution is far less fundamental than the growth of phase #2. Phase #2 included numerous major innovations that created new economic baselines but were not repeatable. For example air conditioning was a great advance in that it allowed people to live and be productive in times and places they could not before; but now that we have those productivity gains AC isn’t adding any more new benefit. A thought experiment helps to illustrate the fundamental importance of the inventions of IR2 compared to the subset of IR3 inventions that have occurred since 2002. You are required to make a choice between option A and option B. With option A you are allowed to keep 2002 electronic technology, including your Windows 98 laptop accessing Amazon, and you can keep running water and indoor toilets; but you can’t use anything invented since 2002. Option B is that you get everything invented in the past decade right up to Facebook, Twitter, and the iPad, but you have to give up running water and indoor toilets. You have to haul the water into your dwelling and carry out the waste. Even at 3am on a rainy night, your only toilet option is a wet and perhaps muddy walk to the outhouse. It’s hard not to be suspicious of the sticking-power of today’s IT driven growth, especially when you consider there are probably 1 billion pictures of cats on the internet. Anyway what Gordon is saying is that phase #3 has a great many incremental improvements, but in the larger scheme of things few game-changing innovations. Thus, phase 3 brought us a flare of intense growth but is diminishing as the world quickly becomes saturated with PCs, phones and software. Now let’s turn to the robots notion. Krugman’s first post on this was titled (in a nod to Asimov, I suspect) Rise of the Robots. In that post he observes that labor’s portion of GDP – i.e., wages and direct payments to employees compared to total production – has been dropping steadily since the early 1970s; this is after staying mostly steady through the 40s, 50s and 60s. In a way that is to be expected – since we are becoming more productive, each $1 paid in wages should be producing more and more goods (although I suspect socially and politically there’s more going on here than just productivity improvement). The question is, where will it end? A telling event is Asian tech manufacturer Foxconn’s announcement to deploy 1 million robots. Foxconn currently employs 1 million workers. While the company states the purpose of the robots is to enable “advanced manufacturing”, no one doubts that a great many workers will be displaced. And this is in a region where wages are amongst the lowest in the world. On the other hand, automation may enable the return of manufacturing to the developed world, just as Apple has stated it is investigating. Regardless of where it happens this trend in automation could lead to even greater economic inequality. More and more profit will go to those who own the means of production – i.e. the robots – and less and less to people who work. Machines displacing workers is nothing new – that is how the term sabotage was invented after all – but in the recent past we have had growth to reduce the impact: Workers got less of the pie, but the pie was growing really quickly. Now pie-growth is slowing and may even stop. Are there real, move-the-needle innovations yet to come from the IT revolution? Or will we be just using algorithms and machine intelligence to make our existing stuff incrementally smarter? What kind of opportunities are there for individuals or small teams in the upcoming automation revolution? Do we need to re-examine our ideas of growth? Maybe Stiglitz is right, that we need a better GDP, that includes externalities and quality of life and not just raw production.